Lelands current auction, dubbed the "Steel Curtain" auction due to large number of Pittsburgh Steelers jersey's available, includes several fantastic Dodger items. I'll highlight a couple of them here and focus on a group of other stuff from the collection of former Dodger pitcher Claude Osteen later on. 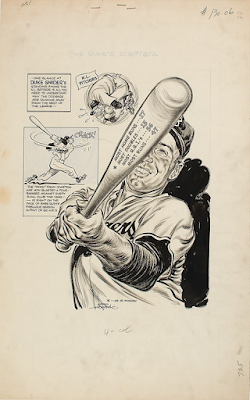 The "Dook" from Compton has now blasted a four-bagger against every rival club this year -- Is right on the pace of Babe Ruth's fabulous season output of 60 HR's. The Dodgers success and eventual World Series triumph was due in large part to the efforts of the Dodger centerfielder. We whacked a total of 42 home runs and drove in a league leading 136 runners. And as the drawing above suggest, at one point during the season (likely during the half-way point) was even on pace to break Babe Ruth's home run record. Below is Pedro Guerrero's 1981 World Series MVP Trophy. 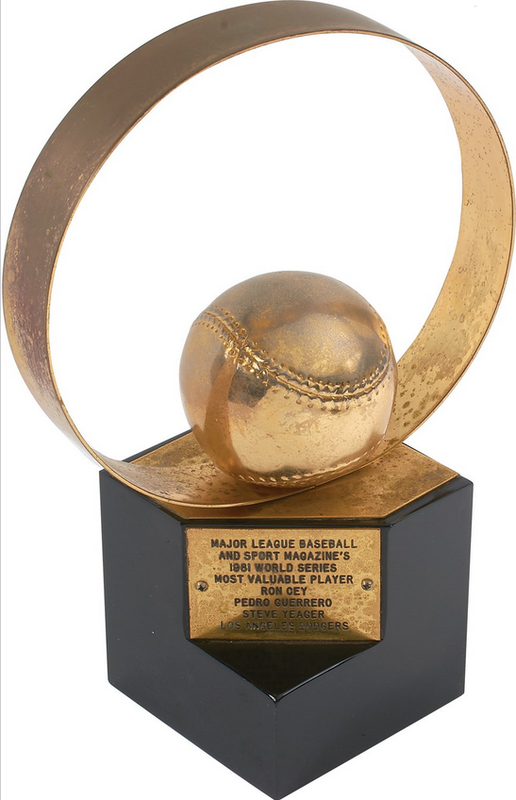 (Auction Link) As you know, this year three Dodger players were named co-MVP's. Along with Guerrero, Steve Garvey and Ron Cey also received this award. Pedro slashed .333/.417/.762/1.179 during the series (going 7 for 21), hit two home runs and drove in seven.